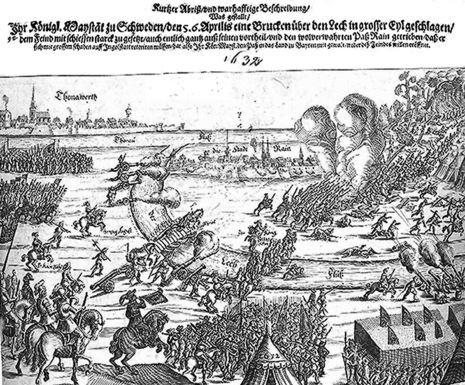 The Battle of Rain (also called the Battle of the River Lech or Battle of Lech) was fought on April 15, 1632, as part of the Thirty Years' War. 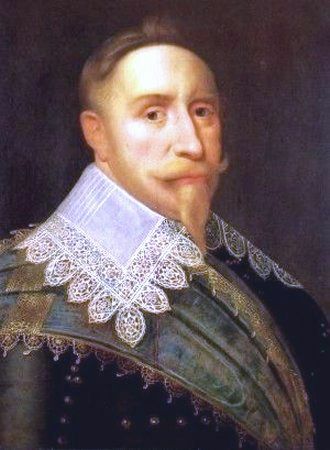 The forces involved in this conflict were 40,000 Swedish troops under Gustavus Adolphus and 25,000 Catholic League troops under Count Johan Tzerclaes of Tilly. It was the second meeting between the two legendary generals (see First Breitenfeld when Tilly received the first setback of his long and storied career) and like at Breitenfeld, Tilly lost when Gustavus forced the River Lech under the cover of his superb artillery, and as there, Tilly was wounded several times and fell during the battle and was carried from the field by his men who called him Father Tilly — only this time, he would not recover from his wounds. Gustavus had a bridge of boats constructed across the Lech river near the city of Rain through the night prior to the battle, and in the morning sent three hundred Finnish Hackapelite troops across the river under fire. The Hackapelites dug earthworks for batteries which then protected the rest of Gustavas' army as they crossed the river. As soon as his army had crossed the river, Gustavus immediately and successfully stormed the hill. Tilly was shot in the leg early in the battle and was moved to the rear; his second in command, Aldringen, was knocked unconscious with a skull fracture minutes later. Maximilian I, Elector of Bavaria ordered an immediate retreat to save the now leaderless army, leaving most of the Catholic League's baggage and artillery on the field. The army itself may only have escaped destruction due to storm and high winds blocking roads in the night that followed. The immediate result of the battle was that the grand duchy of Bavaria lay open for occupation by the Swedish army, enabling Gustavus Adolphus to temporarily threaten the Austrian heartland. 1. A strong feint attack by a portion of the Swedish infantry with heavy artillery support against Tilly's strongly fortified center behind the river Lech. The intended effect was to attract the full attention of the Imperial army and its reserve. The Swedish force succeeded in establishing and fortifying its position on a small island or peninsula close to the Imperial side of the river. From this position, it was able to repel a series of fierce Imperial counterattacks despite being outnumbered. When Tilly was mortally wounded, the discipline of the Imperial army quickly dissolved and the army withdrew before the arrival of the Swedish cavalry. Thus, Tilly's death possibly saved his army from a complete defeat. Nonetheless, both armies suffered considerable losses (3,000 on the Imperial side, 2,000 on the Swedish), mostly due to frontal attacks and counterattacks against fortified positions with strong natural defenses. The battle of Lech proves more than the Battle of Breitenfeld the innovation of Gustavus Adolphus' tactical imagination. His daring frontal attack in combination with the deployment of a large part of his army for the flanking movement has similarities with the tactics of the Duke of Marlborough at the battlefield of Blenheim (situated in the very neighborhood of Rain) or of Frederick the Great at Leuthen. 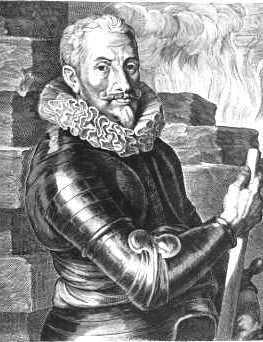 The disciple of Gustavus Adolphus, Johan Banér, also employed a similar battle plan four years later in the battle of Wittstock. Tilly resolved to make a stand at the River Lech. 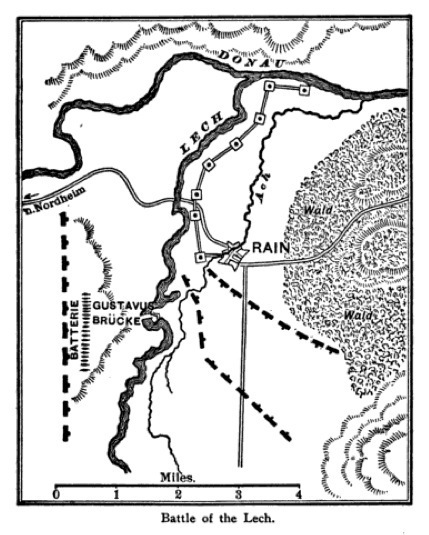 On 15 April, 1632, near the city of Rain, Gustavus crossed the river in the teeth of Tilly’s army. As at Breitenfeld, the Swedish artillery swung the tide of battle. Under murderous cannon fire, Tilly was unable to prevent the crossing. Once on the other side of the river Gustavus made short work of Tilly’s remaining forces. During the battle Tilly was mortally wounded by cannon fire. His fleeing troops carried him to Ingoldstadt. There the Virgin Mary’s general expired on 30 April, 1632. The Swedish forces ravaged Maximilian’s defenseless Duchy. In mid-May, 1632, they captured Munich itself. Maximilian himself had fled to Salzburg and Habsburg protection.